Working with Dr. Marc Edwards and his research team in Civil & Environmental Engineering and the U.S. Green Building Council, two student members of the SFI Lab are surveying green buildings around the U.S. that have employed cutting-edge water conservation technologies as part of their facilities. In this project sponsored by the Water Environment Research Foundation (WERF) and Virginia Tech’s Institute for Critical Technologies and Applied Sciences (ICTAS), Ben Chambers and Viveka Nalluri, both M.S. students in Civil & Environmental Engineering, are working with Dr. Pearce to build a database of case studies of buildings using innovative water-related technologies in the U.S. After the database is built, the team will conduct a three-tiered study to highlight projects with cutting edge water-related technology that are experiencing unanticipated consequences through a web survey. The results of the web survey will be used to filter projects for subsequent telephone interviews and selected site visits to explore the underlying causes of problems being experienced. 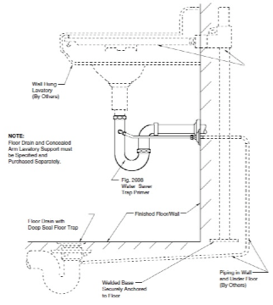 automatic drain trap refill system that uses graywater from sinks to keep floor drain traps full and prevent the escape of sewer gases into occupied spaces. One case study building experienced problems when soap scum from hand-washing clogged the supply tubing in a bathroom with infrequent use, allowing the traps to dry out and causing unpleasant odors. After decades of attempting to make our facilities more efficient, anecdotal evidence suggests that there may be unanticipated consequences of designing for maximum efficiency, including increased pathogen growth in hot water heating systems, bacterial contamination and taste problems in water that doesn’t move through supply lines quickly enough, and degradation of system components due to physiochemical reactions within water systems. This study will inventory the current population of green buildings to find out what water-related innovations work, what doesn’t work, and why. 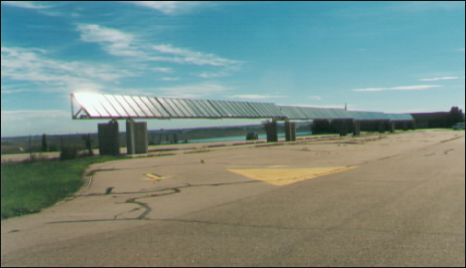 Above: This solar hot water heating system was employed in a case study facility as part of an initiative to save energy used for water heating in a federal visitor center. A year after the facility was opened, the building operators disconnected the solar system and replaced it with a tank-type hot water heater because it represented a maintenance risk for the facility. When the team finishes identifying the spectrum of problems experienced by stakeholders in the case study facilities, methodologies including the Hazard Analysis and Critical Control Points (HACCP) technique will be used to derive lessons learned that can help project teams develop their facilities to avoid such problems in future projects. The final results of this project will be published by WERF to support more sustainable design of water-related systems in building projects. For more information on this project, contact Dr. Marc Edwards (edwardsm@vt.edu) or Dr. Annie Pearce (apearce@vt.edu).